Note: As explained in this post, in honor of me and my wife’s first year of marriage, I’m going to spend the second year posting monthly reflections of the same month a year earlier. This is the ninth installment. From the beginning of this project, as I looked over the months and dates I would be posting, I knew what this post would have to be about. April 21st is the birthday of my (our!) nephew, Jacob, who turns 7 today! (Happy Birthday, buddy!). But it’s also a very bittersweet day, as it’s the day we reflect on the life and passing of my sister, Heidi — Jacob’s mother — who never lived to see her son. That day, seven years ago now, was one of the most grim, surreal experiences of my life; I remember waking up in the morning, preparing to spend the day working on a graduate seminar paper due at the start of the week, knowing you had a full day of rehearsal with some colleagues. When my youngest sister, Shanda, called to say Heidi — one week shy of her due date — had rushed to the hospital, ostensibly to start delivery, I paused in my work and walked over to the grocery store to pick up a card to put in the mail as soon as the good news came. At last — I would be an uncle! And we would all finally learn what name Heidi had chosen for her son, the name she teased us all with for months, saying she had picked it out but wouldn’t tell us until he was born. Instead, when my cellphone rang perhaps 2 hours later, the first words out of my father’s mouth were “You’d better sit down,” and I knew everything he was about to say, just from the tone of his voice. All light and air were sucked out of the room at that moment; I remember holding onto the door frame in the kitchen to keep from falling down, and then starting to make phone calls, simply because I didn’t know what else to do. At some point, I called you and left a message. I don’t really recall what it said, I’m pretty sure I did a lot of rambling. I took that card out of my wallet numerous times over the days that followed, and I cannot describe the feeling that came over me each time I viewed it. In the terrible darkness of making funeral arrangements, traveling to the funeral home for a private viewing, the day of the funeral, then traveling to the hospital to bring Jacob home with us, spending the day packing up Heidi’s apartment, I took that card out more times than I could count, and it never failed to raise my spirits. I never get tired of looking at it — I carry it with me in my wallet still, and I look at it often. And when I flew back into town one week later (but feeling oh, so much older and wearier), you were there at the airport to give me a massive hug and drive me home, presenting me with a mix CD and a hiking guide, knowing that I would want to put my feet on the trail and smell the fresh ocean air to start the healing process. When we arrived at my apartment, we collapsed next to each other on the floor, absolutely exhausted, mentally and emotionally drained. And I was never so happy to just lay on the floor with someone, not speaking, not even following a single train of thought — just letting the moment happen and feeling something other than primarily darkness and anger for the first time since that awful phone call. That was a dark time, to be sure — but it would have been far darker without your love and support. I had many wonderful friends who reached out to offer anything I needed (and I love all of you, for that and so many other reasons), and I owe so many folks for their help in the weeks and months that followed. Yet when I needed someone to just be there for a few moments, to listen as I tried to talk my way around the anger and the frustration and the grief, it was you I reached out to first, and you never turned away, never said you were too busy, or ignored me. You just listened, and when there was nothing else to say, you would take me on a drive through the hills outside of town, or out to the coast, or to one of our favorite restaurants. April 21, 2007, marked the first real personal crisis either of us had endured since we began dating, although it would not be the last. But we were already learning how much stronger we were together, how much we could rely on each other for support and stability and grace in times of trouble, in that time and in other moments that followed. We’ve seen some rough days since then, although none, thankfully, perhaps quite as difficult. I know darker days will come — such is life, after all — yet I also know that we can survive anything we encounter along the way. I’m honestly not sure what I could or could not make it through on my own, but I’m smiling even now at the thought that I don’t have to — I have you to help me through whatever comes, and you have me (I think I’m getting the better part of that bargain, though!). Thinking of your whole family today. 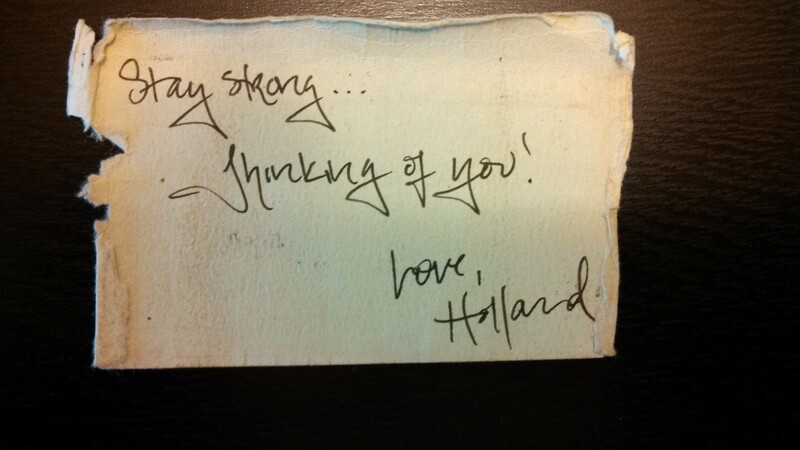 Glad you and Holland have each other! Thank you so much for including us to read your story! This is precious…and thinking about you all at even another memorial of that sad day!